Every second counts and every voice matters. Urgent: action needed TODAY to stop Fast Track for the TPP. Click here! Bad news first: Fast Track legislation to ram through the Trans-Pacific Partnership (TPP) has now passed out of committee in both the U.S. House and Senate, and it’s moving fast. But both the Obama administration and corporate-backed Republican leadership are working together to spread propaganda and claim there is “nothing secret” in the TPP – while the entire text is still classified! Worse, they are literally bribing reps with a fancy dinner if they vote for the Fast Track bills . The vote is going to be painfully close. Every second counts and every voice matters. Will you speak out today? 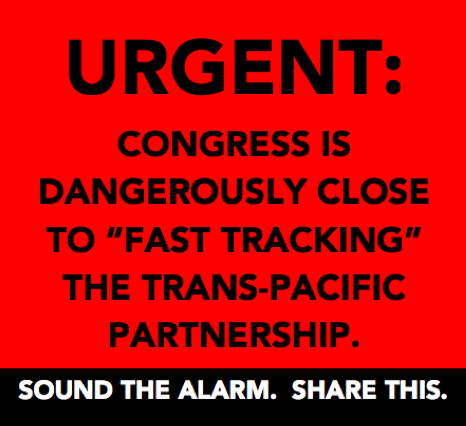 Click here to take urgent action to stop the Fast Track bills now. This is a huge opportunity. If we can defeat Fast Track legislation in the U.S., it’s very likely that the entire TPP will fall apart. This is our chance to change history and to make it clear we won’t accept a future where decisions that affect our lives are made by governments in secret. P.S. Rep Nancy Pelosi now plays a key role in whether these Fast Track bills move ahead. Will you click here to tweet at her or call her office at (202) 225-4965 to tell her to oppose Fast Track for the TPP?